A fat bike rider smiles as he rides across a snowy trail at Killington last season, during the Rollin’ Fatties event. Three years ago, a couple of “very clever Brits” came up with an idea for a grassroots, worldwide, fat-bike holiday that would bring the fat-bike community together, according to fat-bike.com. Global Fat Bike Day 2015 will be celebrated across the world on Saturday, Dec. 5. GFBD isn’t owned or run by any commercial enterprise. Rather, GFBD belongs to everyone who has a fatbike and wants to celebrate. Celebrations will vary considerably, from solo cruises to group rides to regional club gatherings and parties. Organizers and fans encourage those participating to share their experiences on social media, to connect with the larger Global Fat Bike Day celebration. Use the hashtag #GFBD2015. “With all of the new hardware that’s coming down the pike, think about how exciting it’s going to be, when we all come together in groups and get the opportunity to take some of these new bikes for a test spin,” wrote a writer identified only as “Gomez” on fat-bike.com. “Or imagine how cool it’s going to be for new members of the fat-bike community to show off their new school rides to the long beards and early adopters in the group. The idea behind GFBD is for the entire fat-bike community to go for a ride together!” he continued. A fat bike is a bicycle with over-sized tires, typically 3.8 in. (97mm) or larger and rims 2.6 in. (66mm) or wider, designed for low ground pressure to allow riding on soft unstable terrain, such as snow and sand, according to Wikipedia. Fat bikes were invented for winter trail riding and racing in sub-arctic Alaska on the Iditarod Trail and, simultaneously, for touring the deserts of New Mexico, the citation continues. Because they are capable of traversing diverse terrain including snow, sand, desert, bogs, mud, pavement, or traditional mountain biking trails, they can be ridden all year long, offering unique challenges depending on the season. 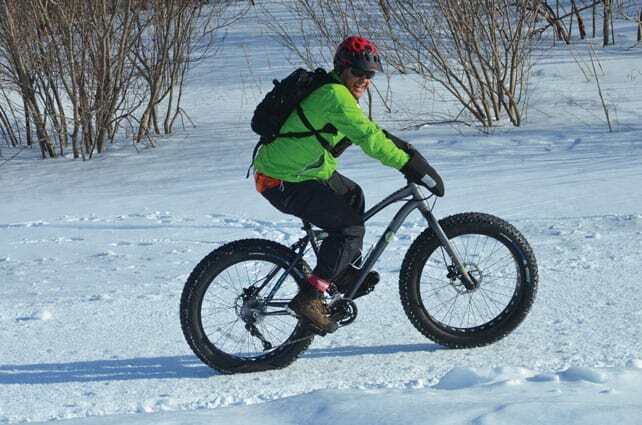 While some think fat bikes are a fad, many fat bike riders disagree. Tony Accurso, owner of Alpine Bike Works and Fat Bikes of Vermont, which opened in Killington last winter, is passionate about the sport and thrilled to be sharing it with riders in central Vermont. Jason DiDomenico, who works at Alpine Bike Works, agreed. “As long as you can pedal you can have a blast on a fat bike, it’s even easier than mountain biking on most terrain due to the fat tires . . . We often say if the skiing is bad then the fat biking is good, cause it usually means harder snow, which is easier for the tires,” he said. Accurso is right, at least as far as sales are concerned. Fat biking has become one of the largest growth areas of cycling, doubling in sales every year since 2010, according to Bicycle Retailer Magazine. Alpine Bike Works has a large fleet of fat bikes to satisfy the area’s increasing demand. They’re available to rent for anyone who want to join the in the global celebration this Saturday.